Use language that empowers people with disabilities such as “person who uses a wheelchair,” “Kevin has a brain injury.” Words such as crippled, idiot, retard or moron are never appropriate. Invite others to #BEtheONE to make change with themselves, schools and community. Make sure your video content is appropriate for all ages and contains no profanity. If you are under the age 18, you must have your parent or guardian sign a video release prior to submitting it. Email datfmn@gmail.com to request the Video Release Form. ALL people in the video must submit this signed form to be considered. Submit your video via email/flash drive NO LATER than 5:00 p.m. on September 13, 2019. Send it to datfmn@gmail.com. Include your name or your group’s name & information and a contact number. The Subject line should say #BetheONE video submission. You will receive notice that your video was accepted, it will be posted on YouTube and you will be given the link. Then it is your job to PROMOTE it! The more views, the greater chance you have of winning! It may only be posted by the Task Force. Winners will be announced by October 1st and you will be invited to come and accept your prize at our Celebration of Abilities on October 22nd at the St. Cloud River’s Edge Convention Center. Your video will also be shown at this event! Please note: No professional photographers or videographers are allowed to participate! PRIZES FOR YOU OR YOUR TEAM! 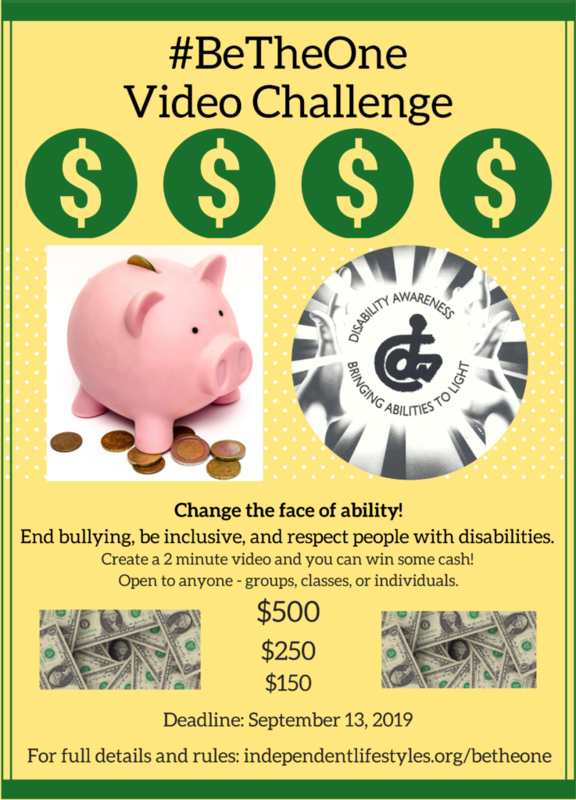 The winners will be selected based on two factors: The most number of views your video receives on YouTube after the Disability Awareness Task Force posts it; and by vote of the Task Force for creativity, positive impact, clear message and following the guidelines above. Each factor will carry 50% of the decision. If you have questions or need a video release form, just email datfmn@gmail.com.